A new study has found that a condition that threatens the lives of some pregnant women and the fetus may continue to put the mother at risk later in life. Mayo Clinic researchers found that women with a history of pre-eclampsia are more likely to face atherosclerosis hardening and narrowing of the arteries decades after their pregnancy. The findings are published in the September issue of Mayo Clinic Proceedings. 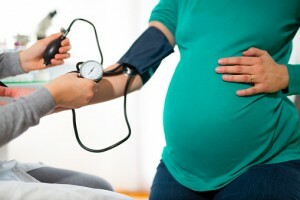 Pre-eclampsia a condition in pregnant women commonly characterized by high blood pressure typically shows itself 20 weeks into the pregnancy, and can occur suddenly or develop slowly. The complication poses a concern to the mother and fetus, and affects between 2 and 7 percent of pregnancies. Using health records from the Rochester Epidemiology Project a collaboration of southern Minnesota and western Wisconsin health care facilities the research team identified 40 postmenopausal women with histories of pre-eclampsia and 40 women with normotensive -or normal blood pressure pregnancy histories. Carotid artery intima-media thickness, or the thickness of the artery walls, was measured in addition to blood tests. The artery wall thickness of women with a history of pre-eclampsia was significantly greater than those with normotensive pregnancies. These findings were echoed in a study of 10 texts. Further study is needed on women with pre-eclampsia histories, according to Dr. Garovic, and that should continue to follow women late into life, where further complications may become apparent.